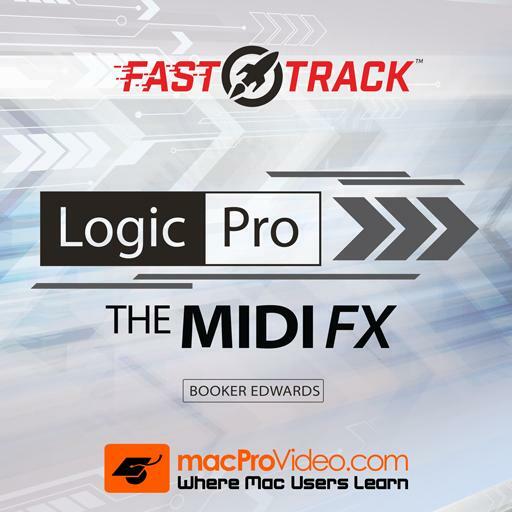 Logic Pro FastTrack 102 - The MIDI FX. Which Velocity Processor mode acts like a “limiter” for incoming velocities? What shortcut is used to create a Track Stack? Note number and velocity are the only events that can be processed using the Randomizer plugin. True or False? You can’t use the “Envelope” to affect the rate of the LFO in the modulator plugin. This is the Chord Trigger mode that transposes the programmed chord by one semitone with every key on the keyboard, in either direction. Name 3 Velocity Processor controls that borrow their names from a traditional compressor. MIDI FX plugins are placed before the software instrument in the signal chain. True or False? On the Modifier MIDI FX plugin, what does the “Thru” button do? It bypasses the effect of the plugin. It duplicates the input event. It passes the plugin's audio output on to the Audio FX plugins. It allows the input event to perform its normal function and be re-assigned to a new event. To delete all assigned chords in the Chord Trigger plug-in, you hold down this modifier key before clicking the Clear button. This MIDI FX plugin allows you to play full chords by triggering one key or pad on your controller. The Transposer plugin can transpose your MIDI events before they reach the Software Instrument on that track. True or False? The Note Repeater emulates the effect of an audio reverb plugin.True or False? Booker uses this well-known Logic instrument to generate processed percussion sounds for his multi-track soundscape.